Pitru Dosha occurs if any ancestors up to the 7th generation on the fathers side and up to the 4th generation on the mothers side expired early or had an unnatural death. The story why the Pitru Paksha is marked by daan and charity has its roots in a tale in the Mahabharata. When Karna died, his soul went to heaven, where he was offered gold and jewels as food. Karna had done limitless charity of wealth, but had neglected Anna-Dana. He found wealth and luxuries, but with no food to appease him. Lord Yama told Karna that he had donated gold all his life, but had never donated food to his ancestors in Shraaddh. To make amends, Karna was allowed to return to earth for fifteen days so he could do Shraaddh and donate food and water in their memory. This period is now known as Pitru Paksha. It is believed that in these 15 days the souls of our ancestors are the closest to the earth, moving around us and as we fail to recognise them, they return to their ORB unsatisfied and unhappy that we do nothing for them. The fifteen days of Mahalaya Paksha consists of 15 Tithi. They are Pratipat, Dvitiya, Tritiya, Chaturthi, Panchami, Shashti, Ashtami, Navami, Dasami, Ekadasi, Dvadasi, Trayodasi, Chaturdashi, New Moon day (Sarvapitru Amavasya). According to Hindu mythology, every individual’s who wants to perform this Pitru Tharpanam, they should do it on the same day of their ancestor died which will fall within any one of these fifteen days. What is Pitru dosha and how to identify it in one’s horoscope? Rahu and Ketu are the two chayya grahas that are responsible for bad yogas in horoscopes. Rahu gives the result at a cost of losing the body. Ketu gives the result at a cost of losing the head. A person under the effect of Rahu or Ketu has to lose one thing to get another. Pitru Dosh is one type of Yoga, which is formed by various combinations and placements of planets and houses. At many places, Saturn is also hold equally responsible for different forms of Pitru Dosh. When Sun and Saturn are in the same house, or having Drishti (affecting each other), it is also considered as Pitru Dosh. Saturn also represents our ancestors. If Saturn is afflicting Moon then predict that Pitru Dosh is from maternal side, while if Saturn is afflicting Sun, then predict that the Pitru Dosh is from paternal side. For this to happen, the 5th lord/house should also be afflicted. There are Pitru Shakti spots imbued with the spiritual potency of exalted Pitru Deva Beings. And then there are Pitru Mukti spots – places so holy that they are able to grant moksha to even these exalted Pitru Devas! Seshambadi near Kumbakonam and Poovalur near Trichy as some of the best Pitru Mukti (ancestor salvation) spots in the entire world. Others are Rameswaram, Nedungudi, Thilatharpanapuri, Innambur, Theerthandapuram and Kekkarai. Considering the whole of the holy land of India, there are more than 1008 Pitru Mukti kshetras including the well-known ones such as Varanasi, Prayag, Gaya, Kedarnath and Badrinath. 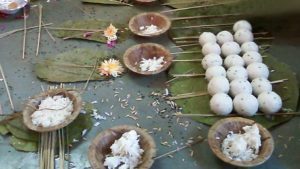 In all these Pitru Moksha spots, the exalted Pitru Devas themselves accept your tarpana, argya and sraddha offerings at all times, but particularly during the Mahalaya Paksha fortnight. 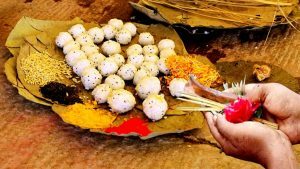 Offerings made give peace to the ancestors and they would bestow their blessings for health, longevity, knowledge, wealth and liberation too, on those who perform, according to the sacred scriptures. Rites, when not performed by the descendants for their ancestors would make them aimlessly wander in the earth plane. Such a state would result in unfavourable conditions for the family members. 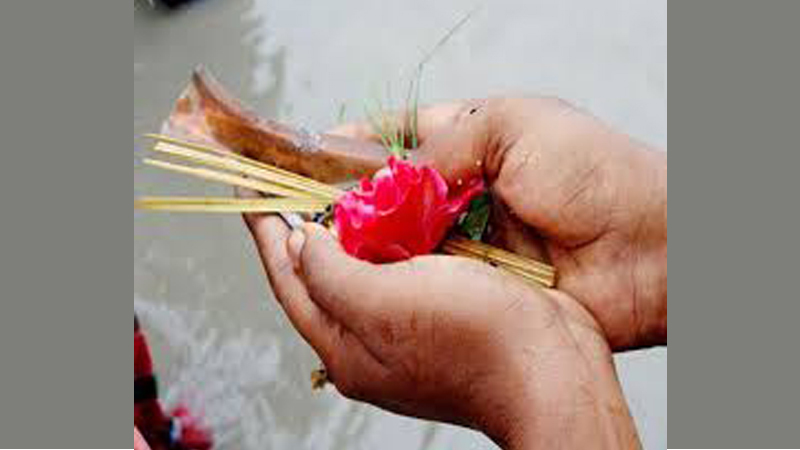 Doing rites for ancestors can solve many problems related to health, marriage, money, family discord, and others. 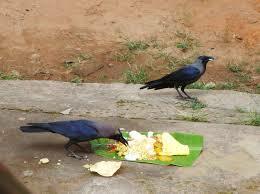 Feeding of the poor should be done and crows should also be fed with the offerings made to the ancestors. During this 15-day period, new projects and undertakings should be avoided. Overseas travel and long journeys are to be avoided. Pilgrimages can be undertaken.